Ed Engle was born in Virginia where he grew up fishing for bass, bluegill, crappie and other warmwater species. It wasn’t long after he moved to Colorado to attend the University of Colorado that he discovered fly fishing and has been an avid fly fisher ever since. 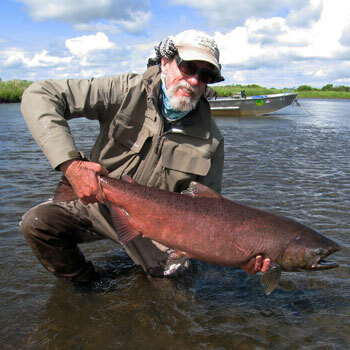 He has fly fished throughout the continental United States, Alaska, Mexico, Chile, Argentina and in Europe for a variety of game fish species with a special emphasis on trout. Ed Engle specializes in tying and fishing small flies. Imitating small insects takes extra care and presenting those tiny flies, detecting the strikes and how to best play a trout on a small fly are all part of fishing small flies. Join us to learn Ed' secrets to accomplishing this. As a fly fisherman Ed is especially interested in small fly tactics and techniques. His small fly fishing research has taken him to a many of the West's famous tailwaters and to spring creeks across the country. He is also dedicated to fly fishing small streams and high country lakes for wild trout. Ed balances out his interest in the “small side of fly fishing” with the avid pursuit of king salmon on the fly. Ed's articles and photographs have appeared in: Fly Fisherman Magazine, Fly Rod & Reel, American Angler, Trout, Warmwater Fly Fishing, Fly Tyer, Saltwater Fly Fishing, Angler’s Journal, Sports Afield, Fly Fishing Magazine, and Gray's Sporting Journal. He has also authored several books including Fly Fishing the Tailwaters, Seasonal: A Life Outside, Splitting Cane: Conversations with Bamboo Rod Makers, Tying Small Flies , Fishing Small Flies and Trout Lessons. Past postions include: Southwest Field Editor for Fly Fisherman Magazine, Outdoor Editor for the Colorado Springs Sun, Columnist for Fly Tyer Magazine, Columnist for Warmwater Fly Fishing Magazine and Contributing Writer for American Angler. Ed lives west of Colorado Springs, Colorado within 40 miles of the South Platte River, one of Colorado’s premier tailwaters where he guided fly fishers for more than 20 years before he retired in 2010. He now spends his time speaking at the Fly Fishing Show venues and fishing clubs throughout the U.S. and writing about fly fishing.